Easy and updated downtown property with beautiful view of the Cedar River. Updated and new furniture with a comfortable feel. Enjoy the Patio and the amazing view. 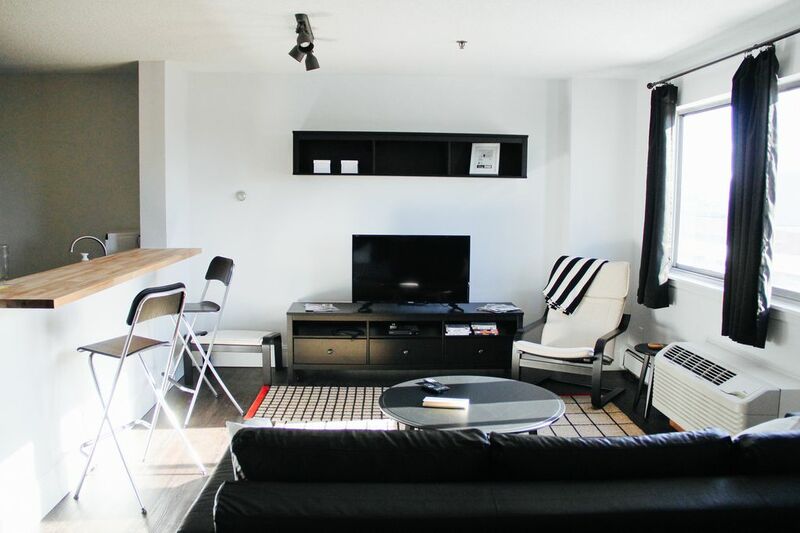 This condo is 650 square feet and is ideal for 3 guests or less. If you have more than 3 guests, please inquire about the availability of another condo (1 bedroom, queen bed, 1 bath) of ours in this complex at the same price or less. Spacious one bedroom apartment located in downtown Cedar Rapids. Within walking distance of NewBo, Czech Village, U.S. Cellular Center, Paramount Theater, and all downtown Cedar Rapids attractions! Perfect for you stay whether business or pleasure. Minutes from restaurants, bars, theaters, event centers, banks, coffee shops, and more. If you don't want to step outside or are here on business, there's a sky-walk you can walk to get to your downtown destination! Hosting for a few years. Enjoy people and hospitality. Downtown, Skywalk, EASY Access to Everything, Parking Ramp. Full Kitchen with River View. All the amenities. High Chair upon request. Breakfast bar and kitchen table. Amazing view of Cedar River and Downtown on PRIVATE PATIO. Great, clean, quiet, and just enough room for us. Set up is functional. Nice place to explore downtown yet easy to drive around too. Convenient when visiting Coe College and just a short drive to the Amana Colonies which is amazing. We would definitely recommend. I spent almost a month in this condo while travelling to Cedar Rapids for work. Prior to my stay the host was communicative and professional. Check in was straight forward thanks to detailed instructions. The condo was clean and comfortable. The kitchen was equipped with the basics and meal prep was a breeze. I look forward to staying here again. The condo was as advertised. Clean, comfortable and a great central location. The condo is walking distance to most things Cedar Rapids has to offer, shows, bars, restaurants and shopping. The location is also in the heart of the business district so it would be a great location if you needed a place to stay for business. Cedar Rapids itself is also a great little city as a fun and safe getaway. Would highly recommend! We stayed in this condo for a weekend visit with relatives, and it met all our expectations. JJ was quick to respond to our questions which made us feel comfortable and at home. We found the area around the condo confusing with all of its one way streets, but gps guided us through the maze. Clean, comfortable, and convenient! Safe, quiet condo in Cedar Rapids, Iowa. Owner met us with keys and a parking pass for the parking garage. He guided us through the amenities of the area and answered our questions. He responded quickly to our questions throughout our 2 month stay. The space was as advertised, with a comfortable king size bed, fully equipped kitchen, bath with tub and shower and air conditioning unit in living room. A roof top patio was accessible from the bedroom. Walking around in town was pleasant and museums, library, theaters, and New Bo were all easily reached.